Red onions are of allium family they are characterized by purple or red skin and white flesh tinged with red. They are medium or large in size and have a sweet flavor. They can be eaten raw, grilled or cooked with other foods, or as a decoration to salads. They lose their distinct color when cooked. Red onions differ from other types of onion such as the white onions with a mild flavor and the Yellow Vidalia onions. The Red onions contain high amounts of fiber and flavonoids as compared to the Vidalia yellow onions and the white onions and can be stored for about 3 to 5months at room temperature. The red onions contain many compounds that can prevent the growth of cancer. Apart from their color, taste, and flavor, the red onions don't cause teary eyes. The red onions are part of the family of plants that belong to the allium family, known to be rich in sulfur that contains amino acids. The allium family has been studied for its ability to fight against diseases like cancer. Onions have been used for the various medicinal treatment of illnesses caused by viruses, bacteria, fungus, and very chronic disease that goes far back to Egyptian healing process recorded many centuries ago. According to researchers, 40% of cancers can be prevented with good dietary habits. The components and nutrients that are found in red onions can reduce the risk of developing colorectal, prostate, stomach, and many other forms of cancers. Are Purple Onions the same as red onions? Yes they are definitely the same...but referenced to with different color names of red or purple. Watch the video to learn what makes red onions so effective at improving health and how they can help reduce your cancer risks. There are various varieties of onions based on color as I have mentioned above but am going to be concentrating on the various varieties of Red Onions. The Red Zeppelin Onions is a close relative to leek, garlic, chive, and Chinese onion. They usually are known to store well for many months. The Red Zeppelin Onion Is known to adapts easily to different environments and resists many diseases. They are also known as the common onion, they are the most cultivated species of the genus Allium. The Red Cabernet Onions are flavorful onions they are characterized by having a classic sweet Spanish flavor that is lightly mild. 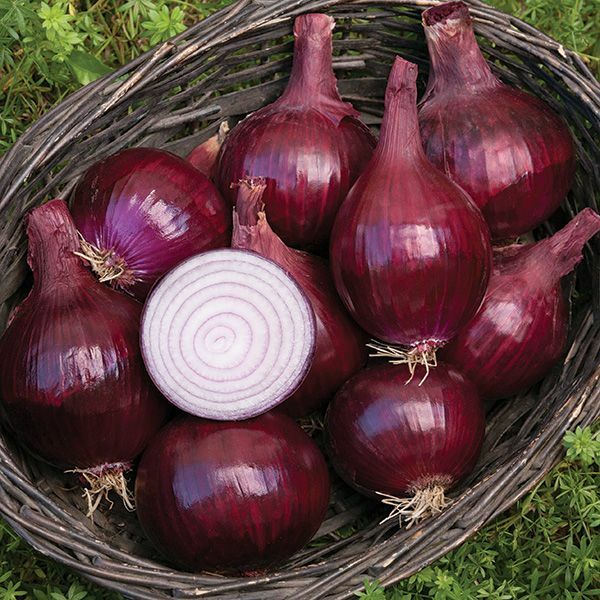 The Cabernet Red Onion is characterized by a deep red color they are mid to large in size and has the shape of a globe. 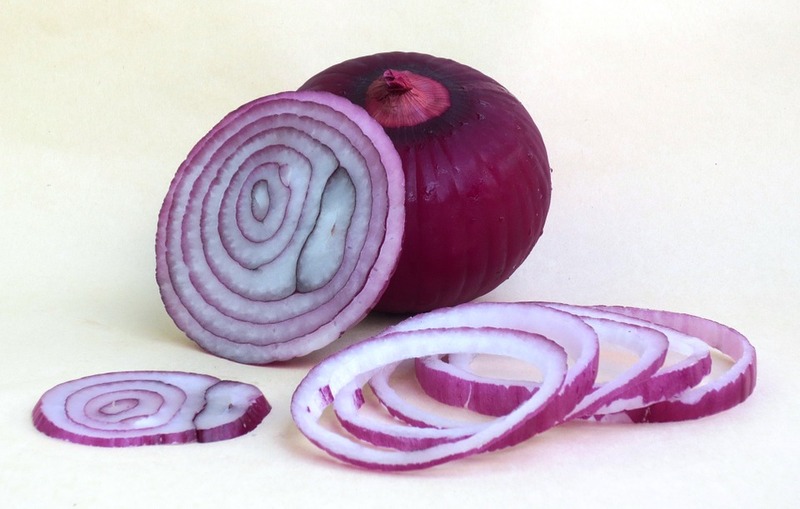 The red onion is also called by its local name caepa de turda. 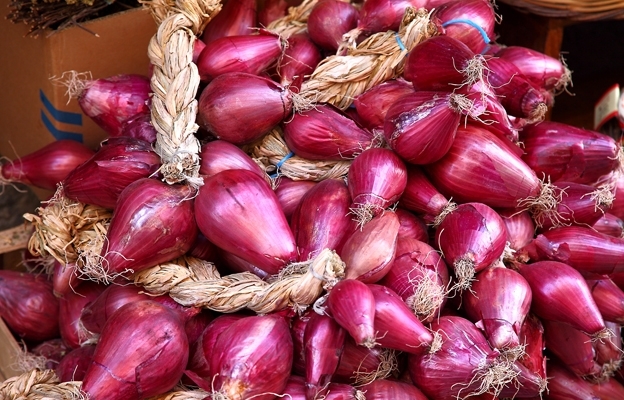 The red onion of turda is characterized by having a distinct aroma and sweet taste. it is also characterized by a cherry and dark pinkish color. The red onions of turda are native to the Romanian towns of Targus Mures, Valea Ariesului, Cluj, and Turda. In Turda the red onion is believed to have a culture that dates back as far as 100year, it has been used in countless dishes and is believed to connect the consumer and producer by an annual festival of onion. The Red Onion of Turda is served fresh, as a part of a mixed salad or salads. They can be found at local markets in Romania. Nevertheless, Turda red onions are facing serious extinction due to the fact that the farmers are aging and there is no one to inherit their tradition, also a difficult market affected by import prices and difficulties in finding new market opportunities and finally the introduction of modern F1 hybrid seeds. The dark Red Brunswick onion is another verity of red onions which has a mild taste with just a touch of pungency. It has a medium to large size, with a flattened top. First cataloged in 1870, Brunswick Red Onion is a dark purple-reddish flattened variety of red onions. it is otherwise very sweet and mild. The Red Monastrell Onions has a deep red color. They have few flat globes and are very large. Their red skin color penetrates the inner rings. They are a little bit larger than Cabernet and has a little resistance to diseases. Another variety of Red onion is the Wethersfield red onion they were a major source of onions for New England until the late 1800s The Wethersfield red onions (Allium cepa) are among one of the best of America’s antique onions. They are characterized by having a mild flavor that is an ideal addition to salads and sandwiches. They are known to be slightly flattened large onion that is characterized by a deep red color and a mild pleasant flavor. Flamenco red onions are quite sharp in flavor, it is characterized by having large globes that have a very thin neck, shiny, and very red skin with fat rings. This is a smaller-sized onion that is quite round. It is ready to harvest early, requiring only about 100 days from seed to harvest. Red Beauty onions is an early bulb and a hybrid variety of the red onion with a neck, it has a globe-like shape and dark red color, and appear small in size. Cipolla di Tropea or onion from Tropea, Italy, is one variety of red onion which is characterized for its sweetness. It is said to have been brought to Calabria by the Greeks, who found out about it from the Babylonians and the Assyrians. Although it was the Arabians who settled in Tropea for a particular period of time that cultivated and aided the spread of Cipolla di Tropea (onion of Tropea) in the region. This onion has a strong and sweet aroma, the shape of its bulb has a purple color and the bulb shapes vary from elongated to round to oval, the inner part of the onion is juicier and whiter than other red onions, its exceptional scent, sweet taste, and lightness makes its a Most Wanted Individual on the ingredient list of Gourmets and Chefs. The Onion of Tropea aside from its exceptional taste and sweetness also has health benefits that are proven and dated back to ancient times. The Roman author, naturalist and natural philosopher, Pliny the Elder, in his book "Natural History", listed 30 Diseases that this onion can treat. 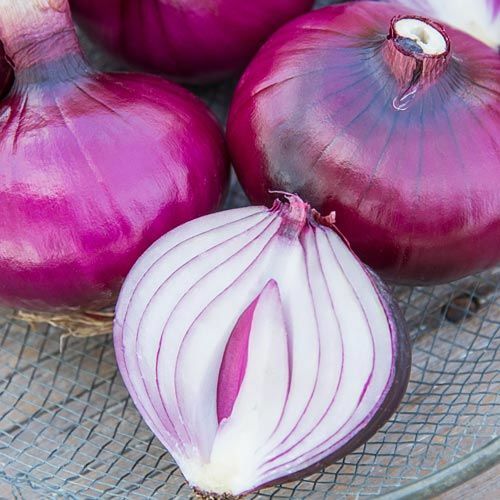 According to Recent studies the Tropea onion, seems to provide better medicinal abilities than other types of onions, especially antiseptic properties, lowering of blood pressure, hypoglycemic, diuretic functions, and, could also be used in dermatology. In March 2008, the European Union registered the Protected Designation of Origin mark for the Red onions produced in this particular area. Would you love to get Pliny The Elder's book Natural History? You could get it form Amazon. The Mars Red Onions is a red hybrid of the red onions family which produces a large-necked, bright Red globed-shaped bulbs. They brownish-red in color they are a bit difficult to grow and the flesh of this onion variety is white and red at maturity. they are characterized with strong bulb and can also be spilled when getting matured. The Red wing onions is a large-sized Onion with a very superior red color, it is characterized by a thick skin and hard bulbs that's why they can be stored for long. This is a Red Burgermaster is a hybrid Onion that is quite sweet and is characterized by having a bright red color, globe shape with a very crisp white and red flesh and is very large in size, they were said to be so large that they a single slice would cover a full hamburger. This Red Onion may not be as sweet as varieties but they have other characteristics that make them different from other red onion species. The Red Creole onions are known to have a pale red color than other varieties and are characterized by a flat top. They can be differentiated from other onions by observing the light red lines that run to the middle of the bulb, they have this pungent taste that inhibits their sweetness as other onions. The Red Baron Onions have a strong flavor than other types of red onions this alone make it a good addition to any type of salad. The Red Baron Onions are mid to large-sized Red Onion with very deep red skin and a purple ring. They are characterized by having a very sharp taste. The Red Hawk Onions is a deep red variety of the Red Onion. They are characterized by an equally flattened bulb, they are Medium to large in size. They are Highly resistance to pink root (Phoma terrestris) disease which is caused by a fungus which is largely present in the soil. In conclusion, There are a lot of red onions especially the hybrid ones, but the facts remain that one of the major benefits of Red onions is that they are a versatile culinary plant that can give a health boost to anyone. 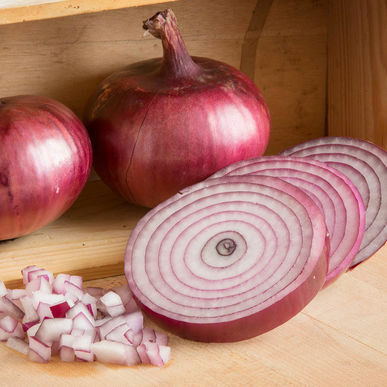 The red onions contain Quercetin, Chromium, and Allicin and can fight against fungi, bacteria, Reduce blood pressure, aid in weight loss, insulin resistance and above all fight against cancer.